Diesels are known to get great mileage. They typically deliver 25 to 30 percent better fuel economy than similarly performing gasoline engines. 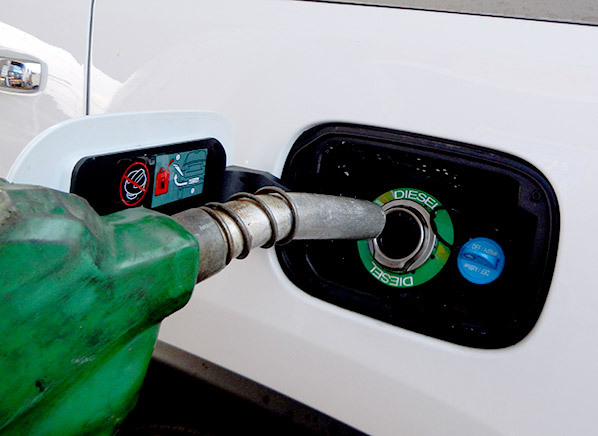 Although diesel fuel used to be cheaper than gasoline, it now tends to cost the same or more. Fortunately, there are a few things you can do to combat increased fuel costs. Every 2% reduction in aerodynamic drag results in approximately 1% improvement in fuel economy. Above 55 mph, each 1 mph increase in vehicle speed decreases fuel economy by 0.1 mpg. Worn tires provide better fuel economy than new tires, up to 7% better fuel economy. Used lug drive tires can get up to 0.4 mpg better than new lug tires. Ribbed tires on the drive axles provide 2–4% better fuel economy than lugged tires. Every 10 psi that a truck’s tires are underinflated reduces fuel economy by 1%. The break-in period for tires is between 35,000 and 50,000 miles. Tires make biggest difference in mpg below around 50 mph; aerodynamics is the most important factor over around 50 mph. The most efficient drivers get about 30% better fuel economy than the least efficient drivers. Idle time is costly. Every hour of idle time in a long-haul operation can decrease fuel efficiency by 1%. Maintain your diesel truck: Regular maintenance keeps your truck running well. It helps your truck use less fuel, too. Get regular oil changes and replace filters. Make sure your tires are inflated properly: Every 10 psi of under-inflation represents approximately 1% penalty in fuel economy. According to Mythbusters, when MythBusters Jamie Hyneman and Adam Savage drove identical trucks under the same conditions across the desert-one with the tailgate up and the other with it down- Jamie's tailgate-closed pickup outlasted Adam's by more than 30 miles. Closing the tailgate actually improves fuel efficiency because it creates a type of airflow called a separated bubble within the bed of the truck. As wind rushes over the moving truck, that bubble of slow-moving air deflects it over the raised tailgate. By guiding surrounding air over and across the bed of the truck, that vortex effect prevents added drag. However, driving with the tailgate open eliminates the bubble effect, pulling the air toward the truck bed and creating more drag rather than deflecting the wind. Some gas-conscious pickup drivers still swear by leaving their tailgates open, but science sides with leaving it up. Keep what you need: Carrying around unnecessary items such as full heavy toolboxes weighs down your truck and you burn more fuel. Only keep what you need in the truck. Drive and accelerate slower: Driving slower helps you save fuel. Replace the exhaust system: Installing a high-quality diesel exhaust system will increase air flow rate, reduce back pressure, provide more horsepower and increase fuel economy. Trailer type and loads hauled in addition to the vehicle speed will determine the effectiveness of a particular feature in regards to fuel economy. Some ways to improve MPG for a diesel car. Don't Idle: Recent model vehicles don't need to be warmed up very long, so there is no point in warming them up for 10 minutes. It’s a waste of fuel. Simply turn your vehicle off when waiting to pick someone up. Avoid Stop and Go Driving: Stop and go driving typically happens when you are in the city, or stuck in traffic on the highways. You want to avoid this as much as possible to avoid wasting fuel. Aim for steady driving. Use cruise control when possible and accelerate gradually. Less A/C: The air conditioner drains a lot of power, which comes directly out of your fuel’s power. What are your tips for better fuel economy?